Conservatives, military veterans and their families and supporters are lining up at the box office to buy tickets, watch the movie and proclaim their support for its simple message: despite the politically correct effort to cover up and ignore what really happened, the truth is that we had genuine heroes who rejected the order to “stand down” but instead they rode to the sound of the guns to help fellow Americans under fire at the nearby American compound where the U.S. Ambassador and other Americans were calling for help under attack from hate-America, Muslim Jihadi terrorists. 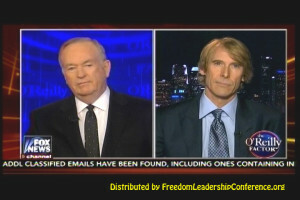 Bill O’Reilly started the interview by immediately labeling Michael Bay’s movie “an action packed motion picture.” He then pointedly told Michael Bay that the New York Times had called the movie “politically divisive.” Michael Bay didn’t mince words in his response. 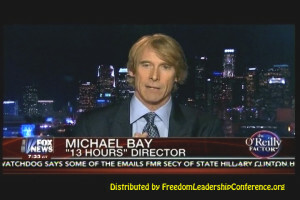 “They’re wrong – it is a movie about an extraordinary group of people … very selfless.” Bay worked closely with the five who wrote the book that the movie is based on and says that high ranking military officers have also publicly expressed support for the movie. The highest ranking such retired military officer who has publicly supported the movie is the Former Commander in Chief of the Pacific Fleet, the largest military command in the world – Admiral James Lyons (USN, Ret.). Admiral Lyons will be the keynote speaker at the Freedom Leadership Conference on Wednesday, May 27 from 7 to 9 PM at the Fairfax Marriott Residence Inn, Fair Lakes, VA. 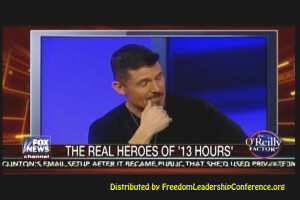 The conference theme is 13 HOURS: The Conference” to focus on the message of the movie and the urgent need for accountability for those who ignored the repeated calls for help from the embattled and surrounded Americans at the American base in Benghazi. You may read about Admiral Lyons’ appearance at the conference by scrolling down to the previous article or else click HERE. Admiral James A. “Ace” Lyons, Jr., (USN, Ret. ), an Officer of the U.S. Navy for thirty-six years, most recently as Commander in Chief of the U.S. Pacific Fleet, the largest single military command in the world, is President/CEO of LION Associates LLC, a premier global, consulting firm providing counsel and advice on foreign policy and security affairs, and a regular op-ed columnist. 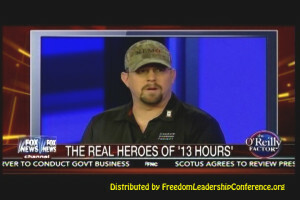 His remarks to the 1/27/16 Freedom Leadership Conference will be available as video and text at this website and at youtube and distributed via the conference free e-newsletter. The movie sidesteps all of that by simply honoring those who bore the brunt of the failure to send help. “The Secret Soldiers of Benghazi” are those who in the past wore the uniform of our armed services – including Navy SEALs and Marines and Rangers – but who were now private contractors working at a nearby U.S. facility who were ordered to “stand down” when they were preparing to go to the aid of their fellow Americans under attack. The movie made it crystal clear that American officials at the highest levels knew every detail of what was going on at ground level from an aerial drone flying overhead and sending the live images back all the way to Washington, DC. 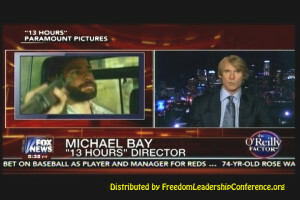 “This movie honors those who put themselves in harm’s way for us” said Michael Bay in his interview with Bill O’Reilly. 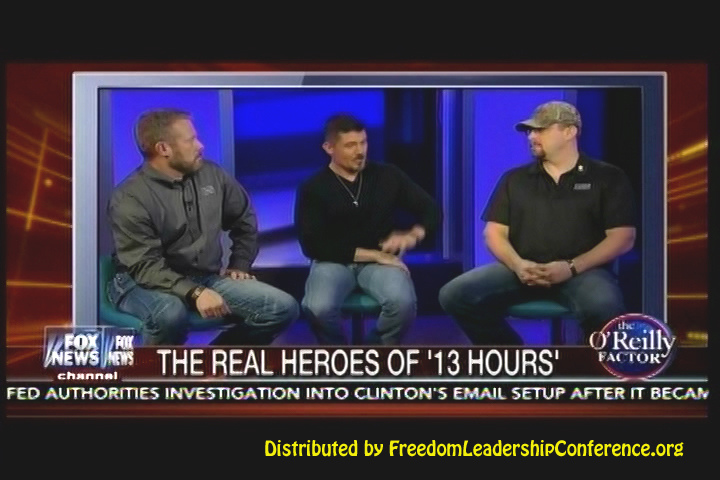 The book that the movie was based on was written from the perspective of the 5 guys on the ground about their “hell night” in Benghazi which led to the deaths of 4 Americans including the Ambassador. It is a movie that makes very clear that right until the very end, with call after call for help, no help from America ever came to enable them to resist the terrorist attack on the compound where they were holed up for the night trying to prevent the killing of the entire group of Americans there. The movie starts right out Bill O’Reilly points out, with a “harrowing” episode when two of the American heroes are pulled over at gunpoint by a much larger force of militia, clearly a dangerous situation which threatened to get out of control. The video clip is 4 minutes, the movie is over 2 hours, the Conference is 2 hours next Wednesday and if you haven’t seen the movie you might want to join a group of conservatives who will go to watch it on the Tuesday before the conference at the movie theater in Merrifield. In addition to the Conference Keynote Speaker, Admiral James Lyons, another frequent guest on Fox TV and other TV outlets, Michael Pregent, will be a speaker, with both presented by the Uniformed Services League, a conference co-sponsor. Pregent is the Executive Director of Veterans Against the Iran Deal. Conference Co-Sponsor GrassTopsUSA will present its own speaker, their President Christopher Carmouche, for a return engagement at the Freedom Leadership Conference. To buy a dinner ticket for the conference click HERE. To reserve a free conference ticket click HERE. To help promote this cause and this conference please circulate the URL for this website at your Facebook page and via email and also print the flyer out and circulate it to friends and fellow conservatives HERE. For those who wish to come early – the 7 to 9 PM conference is free with a suggested donation of $5 to help pay the room rental – dinner will be served at 5:30 to 6:30 with doors open 5 PM. Informal and off the record discussion with the conference speakers and leadership is the main feature of the dinner. Advance RSVP to attend the dinner is a strict requirement. Paying in advance saves you money over the at the door price, go HERE to reserve your conference ticket, or your dinner ticket. We urge conservatives in Northern Virginia or in drive distance to attend this conference and also to mark in your calendar the Wednesday evenings each month that the conference will be held in the future at the same Marriott Residence Inn location: 2/17, 3/16, 4/13, 5/11, 6/16. 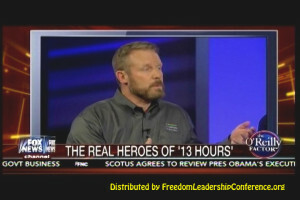 These dates are available for conservative, patriotic or pro-defense conservative organizations to sponsor a conference, write to EventCoordinator@FreedomLeadershipConference.org. Past conference sponsors have a standing invitation to send a speaker (5 minutes maximum) if they do so before the short weeknight conference schedule is filled up. A longer speaking schedule is reserved for organizations which pay a Co-Sponsor fee ($250) or a Sponsor ($500) or Primary Sponsor ($1000) fee which helps pay the conference room rental and advertising. The keynote speaker gives informal remarks at the dinner in his honor with the conference leadership before the function begins, has 14 minutes (maximum) speaking time for their prepared remarks at the conference (which then goes onto youtube and the conference website as video and text) plus another 6 minutes for either Questions & Answers or supplemental or extemporaneous remarks. The sponsor organization also headlines and is a part of all conference advertising including on Facebook, in this space and in the free conference e-newsletter.